Yeah, yeah, I know it’s, like, March in some parts of the world, but I swear where I live, we are stuck in January. Today the high is supposed to be -11. My town invented the Polar Vortex and clearly is having a hard time letting go. A few weekends ago the temperature bubbled over zero, which meant everyone came out of hibernation to celebrate the heat wave. We chose to go sledding since the risk of frostbite and hypothermia was slightly lower than normal. 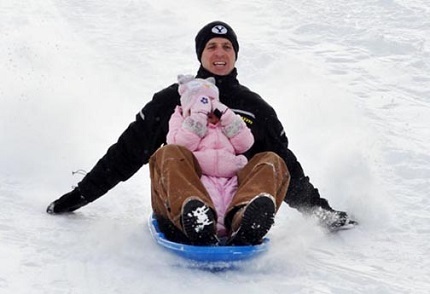 It was actually little girl Cam’s first sledding experience. She loved it, can’t you tell? Something about shards of icy snow blowing in her face the entire way down may have had something to do with it. I have a sinking feeling she inherited my non-daredevil approach to life. Her brothers, on the other hand, made a goal to see how many people they could wipe out on their way down the sledding hill and had a blast doing so (on the sledding and receiving end). I’m actually ok with the prolonged winter. It’s just another excuse to drink my body weight in hot chocolate every day. 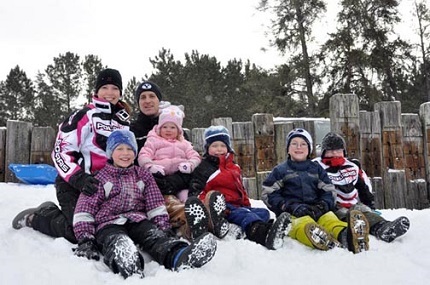 The family enjoys winter as just another excuse to drink hot chocolate. It has been years since I’ve mustered up the desire to make a banana bread recipe that isn’t this one because why mess with a good thing, right? But when my virtual friend Heather told me this cream cheese banana bread really needed to be in my life, like now, I couldn’t resist. I am fairly powerless when it comes to trying new recipes from people I trust. In this case, I made it the same day (where art thou, self-control?). And it certainly did not disappoint. In fact, it totally banished every bit of skepticism waiting in my soul. Comparing this recipe to my favorite banana bread in the whole world is like comparing chocolate to cheese. There’s no point because both of them belong in this world for very different reasons (chocolate for my personal therapy, cheese because, well, it’s cheese). 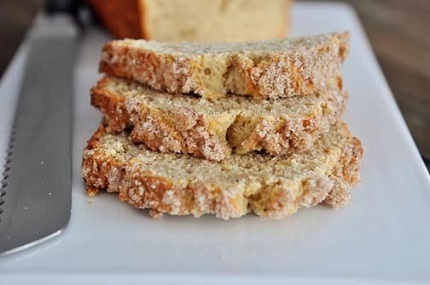 However, just so you know what you are getting yourself into, I will tell you that this cream cheese banana bread is ethereally soft with a creamy texture while the buttermilk banana bread is slightly denser with a bit more buttery sweetness. And just to clarify, there are not swirls of cream cheese running through this banana bread — no, no, the cream cheese is used in the batter, which is why the crumb of the bread is lusciously smooth and tender. The sweet cinnamon topping doesn’t hurt matters either. Knowing that I’ve waited almost five years to post another banana bread recipe worthy of your attention should speak volumes. I take banana bread very, very seriously. Yes, I can definitely say that I will be making this banana bread version right alongside the tried-and-true favorite. It’s pretty amazing, my friends. I encourage you to throw away your self-control, also, and just make it today. You’ll never know what you are missing until you do and I don’t want you living your life with regrets. Preheat the oven to 350 degrees F. Grease two 8 1/2- by 4 1/2-inch loaf pans with cooking spray and set aside. In a large bowl, cream together the butter, cream cheese and sugar until very light and fluffy, 2-3 minutes. Beat in the eggs, vanilla and bananas. In a medium bowl, whisk together the flour, baking powder, baking soda, salt, cinnamon and nutmeg. Stir the dry ingredients into the wet ingredients until combined. In a small bowl, mash together the topping ingredients until combined and crumbly. Divide the batter evenly among the prepared loaf pans. Sprinkle with the topping. Bake for 50-60 minutes until the bread is nicely domed and a toothpick inserted in the middle comes out clean. Remove from the oven and let rest in the pans for 5-10 minutes before turning out on a cooling rack to cool completely.